A Finn and a Spaniard walk into a bar. How do they strike up a conversation? It would be exceptional for either to speak each other’s language. And it would be rare for both to be fluent enough in French, German, Esperanto or Russian – all languages which once had the ambition to become Europe’s lingua franca. No, that Finn and that Spaniard will talk to each other and order drinks in English, the true second language of the continent. Also, the bartender is probably Irish anyway. Europe’s defining trait is its diversity. Europeans don’t have to travel far to immerse themselves in a different culture. And if each only spoke their own language, they wouldn’t even be able to make heads or tails of it. Finnish people probably won’t make a lot out of Spanish, and if you’re from Spain, Finnish might as well be Chinese. But not all languages are as far apart as those two. A Frenchman could understand a bit of Spanish, just because it resembles his own language. And an Estonian can pick up a some Finnish, for the same reason. But the Estonian will have a slightly harder time of it than the Frenchman, and this map shows why. 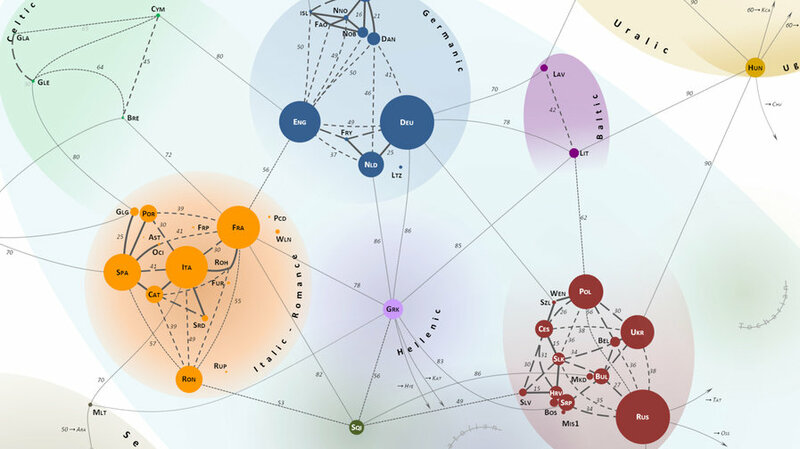 This linguistic map paints an alternative map of Europe, displaying the language families that populate the continent, and the lexical distance between the languages. The closer that distance, the more words they have in common. The further the distance, the harder the mutual comprehension. The map shows the language families that cover the continent: large, familiar ones like Germanic, Italic-Romance and Slavic; smaller ones like Celtic, Baltic and Uralic; outliers like Semitic and Turkic; and isolates – orphan languages, without a family: Albanian and Greek. Obviously, lexical distance is smallest within each language family, and the individual languages are arranged to reflect their relative distance to each other. Take the Slavics: Serbian, Croatian, Bosnian and Montenegrin are a Siamese quartet of languages, with Slovenian, another of former Yugoslavia’s languages, extremely close. Slovakian is halfway between Czech and Croatian. Macedonian is almost indistinguishable from Bulgarian. Belarusian is pretty near to Ukrainian. Russia standa a bit apart, is closest to Bulgarian, but quite far from Polish.
. Catalan is the missing link between Italian and Spanish. The map also shows a number of fascinating minor Romance languages: Galician, Sardinian, Walloon, Occitan, Friulian, Picard, Franco-Provencal, Aromanian, Asturian and Romansh. Latin, mentioned in the legend but not on the map, although no longer a living language, is an important point of reference, as it is the progenitor of all the Romance languages. Lots of coldness in the Germanic family. The bigger members English and German, each keep to themselves. Dutch leans towards the German side, Frisian to the English side. Up north, the smaller Nordic languages cluster in close proximity; Danish, Swedish, Norwegian (both the Bokmal and Nynorsk versions). And look at the tiny Icelandic, Faroer and Luxembourgish languages. Aren’t they cute? The Celtic family portrait is a grim picture: small language dots, separated by a lot of mutual incomprehension: the distance is quite far between Breton and Welsh, a bit closer between Irish and Scottish Gaelic, and further still between the first and second pair. The Baltics constitute the smallest family, but a fatter pair. Still, Latvians and Lithuanians don’t seem to be on very good speaking terms with each other. All the aforementioned language families are part of the wider Indo-Germanic language tribe. Meaning that there are some points of convergence, even if the lexical distance is great. But it’s nice to recognise an English fish in the Irish iasc, and to realise that the German Vater and the Greek pateras share an Indo-European root. Even beyond the wider bonds of the Indo-European language family, some lexical links exist. Between Finnish and Swedish, for example. Not because of linguistics, but because of history and geography, having shared so much of both. Which explains why even Basque, Europe’s most isolated, most mysterious and probably oldest language, shares some distant traits with Spanish and Breton. The Uralic group consists of two subgroups, one sort of uniting Estonian and Finnish, the other consisting of Hungarian all by itself. Answering the age-old linguistic conundra of whether Finnish and Hungarian are really related (yes) and if so, do they understand each other (somewhat worse than an Albanian and a Frenchman). No person is an island, nor is any of the languages we speak. But it can be a pretty long swim between all those palavering peninsulas. Still, if the bartender is Irish, what could possibly go wrong?